I liked the edge detail and added it to my sewing queue for this summer. But when it got to the top of the list, I decided I didn’t like the angled edge, and wanted something rounder. 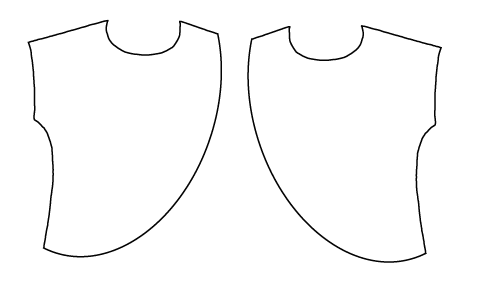 Asking Google, I got 2 different designs: The rounded tulip hem starts either under the arm or at the shoulder. And sometimes the tulip is the front and sometimes in the back. 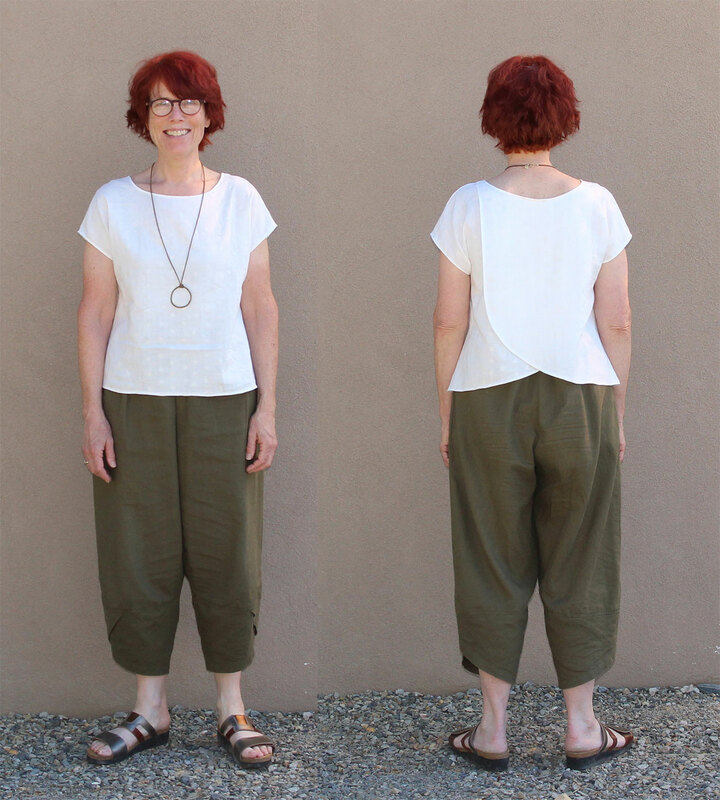 I quickly found a Grainline Scout Tee hack with a tulip hem starting at the shoulder by Laglov. And another by Katie of What Katie Sews with the hem starting at the bottom of the arm hole. I’ve made several scout tees and have had some fitting problems with them. I’ve had better fitting luck with Marilla Walker’s Maya top pattern, so I decided to use that as my base pattern. And I like the hem coming from the shoulder rather than the arm hole. I also thought it might be interesting to make the top reversible, so I can wear the tulip hem in either the front or the back. Drawing the hem curve was a bit tricky as my french curve ruler isn’t long enough — I did it free-style and smoothed it out with my ruler. My ruler is almost long enough to draw the under-the-arm-hole hem, so that would have been an easier hack. 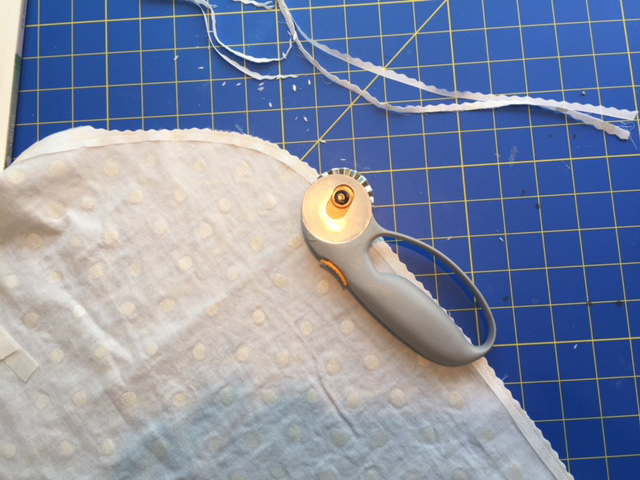 I attached it like bias tape — sewing to the right side of the fabric with a 3/8″ seam, clipping the curve as close to the stitching as possible with my pinking bladed rotary cutter (much easier on my hands than pinking shears), turning & pressing the hug snug to the wrong side, then stitching down from the right side. The hug snug presses really well! Now I thought I had all hard bits solved and was ready to sew! I basted the 2 front pieces together at the shoulder and neckline, and then sewed the top up as if the front was one piece. I liked my hug snug hem so much that I did the back hem, sleeves and neckline the same way. 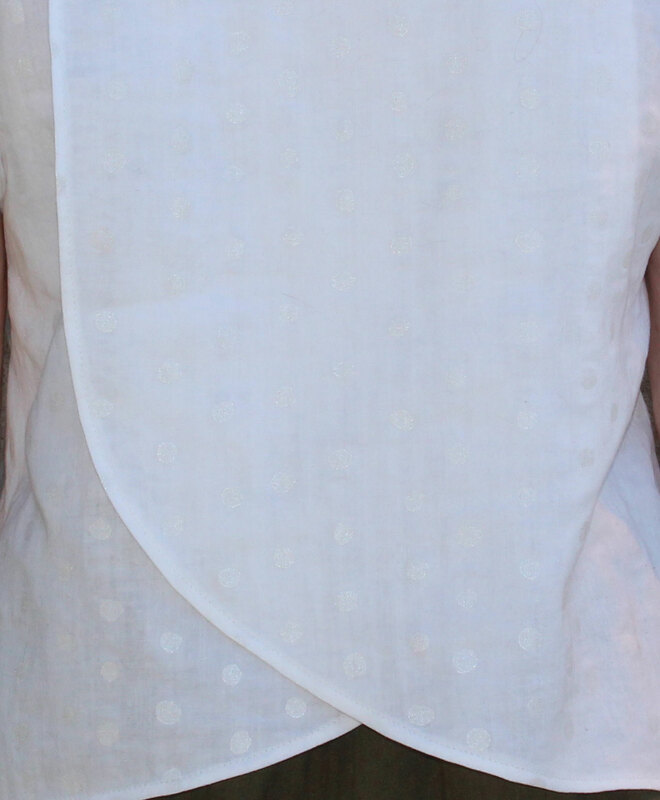 After wearing the top, I see that the weight of the tulip hem side pulls it down a bit, so it’s good I made a deeper neckline for the back (or front if worn reversed). 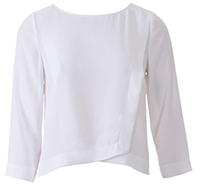 I don’t have a white short sleeve top for summer, so this fills a hole in my closet! I participated in Me Made May for the first time this year. Zoe, the instigator, calls it a “challenge to improve your relationship with your handmade wardrobe.” Participants make a pledge for the month of May, and mine was to wear one me-made garment every day and document them on my instagram feed. Here’s what I learned, followed by snaps of each day’s outfits. I have several ready-to-wear garments I didn’t wear because I have no me-mades to pair with them. During the month I made a tee to go with my favorite skirt, and I’ll be ordering fabric to make another tee for another item I wear often. 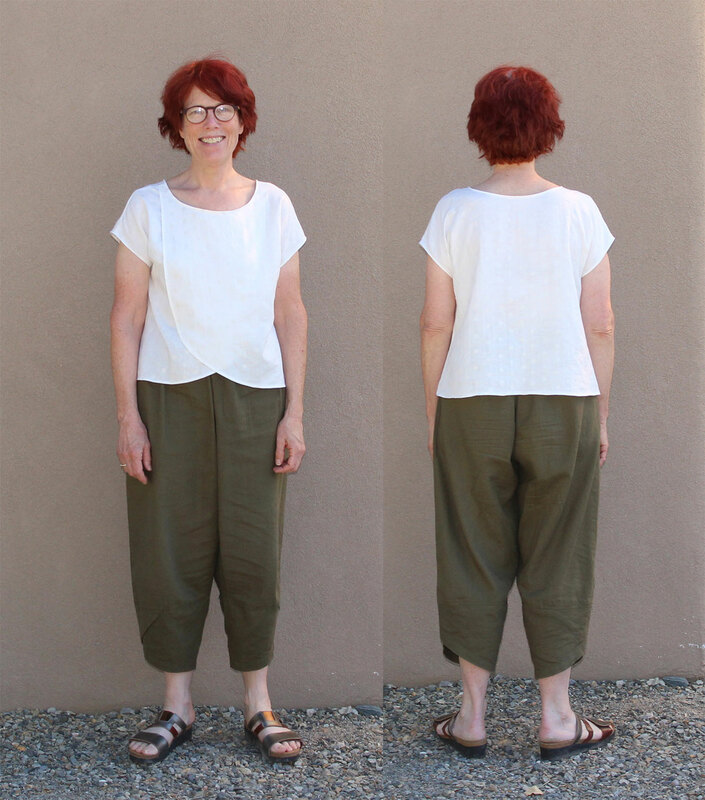 I had a big ah-ha moment: I have a pair of cropped pants that I wear a lot in the summer. I’ve looked without success for similar pants in other colors. But, duh, my sewing skills are good enough now that I can make my own! 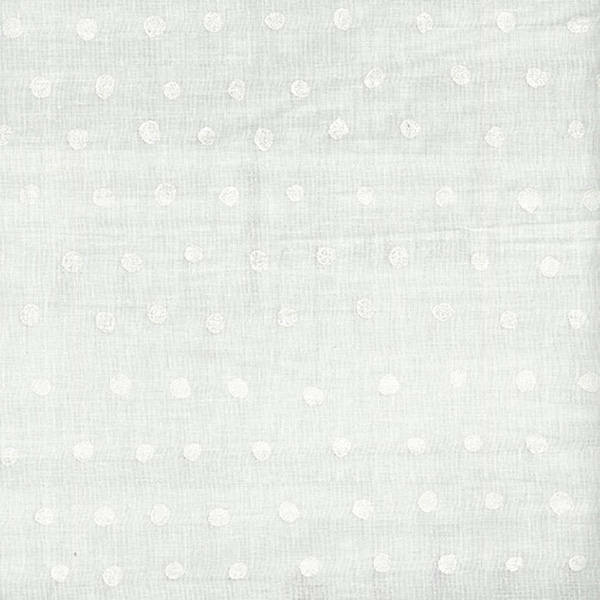 I’ve found a pattern to start with and ordered some fabric. Taking pictures turned out to be easier and less onerous than I thought. I picked the one bare wall at our house, and used that as a backdrop every day. Probably very boring, but it’s helped me evaluate my outfits and made picture taking time really easy. 100 acts of sewing’s Shirt No 1, cut up and made to approximate a Rachel Comey shirt. Slowly replacing my ready-to-wear wardrobe with a handmade one.